We’d love your help. 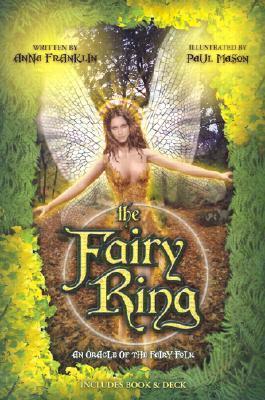 Let us know what’s wrong with this preview of Fairy Ring by Anna Franklin. Combine astounding, photorealistic images with breathtaking surreal art that feature the world of the fairy, and you have The Fairy Ring oracle. This deck has four suits, one for each season, plus eight additional cards that celebrate the major Celtic "Fairy Festival" holidays. Included with the deck is a 240-page book that is filled with fairy lore, the meanings of the cards, their myths and legends, how to work with the fairy or character on each card and an amazing nine different spreads you can use. This is more than just a divinatory deck--it's virtually an entire spiritual, magickal, and oracular system! To ask other readers questions about Fairy Ring, please sign up. I really enjoy this deck/book, and it has great layouts and meditation/visualization exercises, but lately I have not been enjoying it as much. I think that sometimes you are in a certain mind set and need one deck and at other times you need another deck. I think I need to come back to this one a little later. The book is very comprehensive as to meanings, but I need to put my own meaning into them as well, and the book makes it hard to do. Though if you just read the descriptions of the cards a I really enjoy this deck/book, and it has great layouts and meditation/visualization exercises, but lately I have not been enjoying it as much. I think that sometimes you are in a certain mind set and need one deck and at other times you need another deck. I love these! And as an added bonus, they're a much more manageable size than their Sacred Circle deck. The only drawback is the limited number of models--it can be distracting to notice that Fairy X is the same person as Fairy Y when they're obviously meant to look really different. But this is a minor gripe.